Many people find it hard to imagine how we get started with the mechanical and physical interactives you see in the new re-developed National Museum of Scotland. Here is one example of the process of paper ‘mock-ups’.. This interactive can be found in the Patterns of Life gallery. It started with some wonderful photographs we found, in a book called ‘Material World’ by Peter Menzel. The photographs show families from around the world outside their homes with all their possessions. The working title for the ‘Patterns of Life’ gallery was ‘People and Possessions’ and so the photos felt like a very good fit. We sought permission to purchase the rights to use the images and were granted. Next, we felt that the exhibit would really benefit from an active way in which visitors could discover the images, and also place them in a geographical context. So I bought a large geopolitical wallmap and inserted some of the images into the map behind flaps. We tested this on gallery with our visitors and it proved to be extremely popular with families. The next problem was what kind of map to actually use in the gallery. 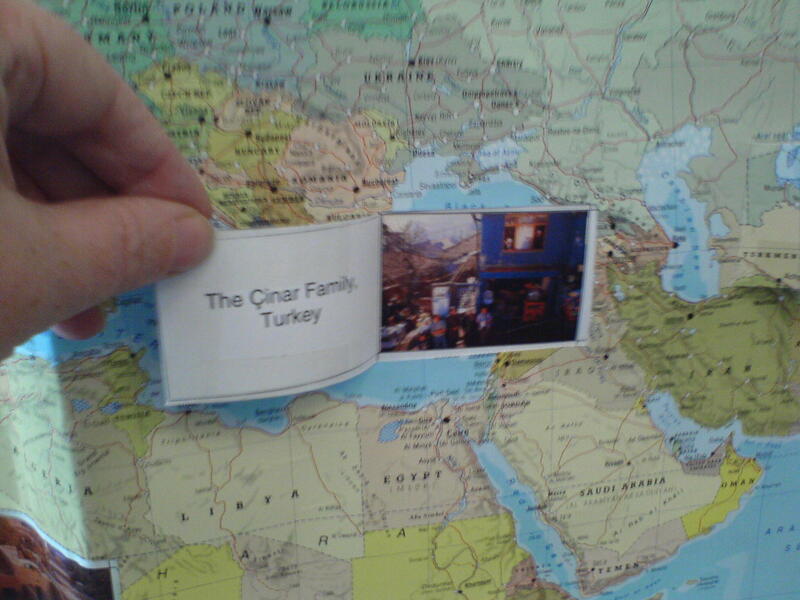 We noticed in our testing that visitors really enjoyed looking at a reasonably detailed map showing the location of countries they had visited or heard about or read about. We felt strongly that our map, while simplified, had to retain that level of detail. The gallery Patterns of Life is divided into four regions – Africa, Asia, Middle East and Americas. 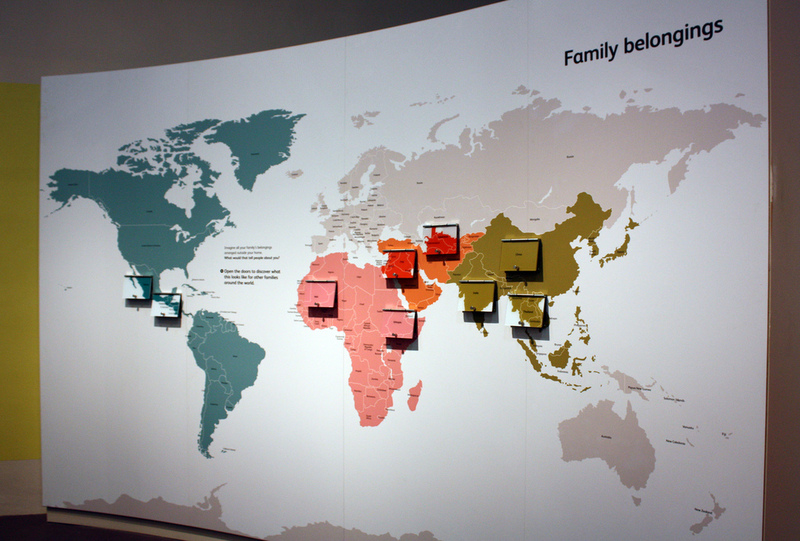 Each area in the gallery has a colour, and so to link this exhibit with the rest of the galleries we used the same colours in our map.